An early example of the camera in action! 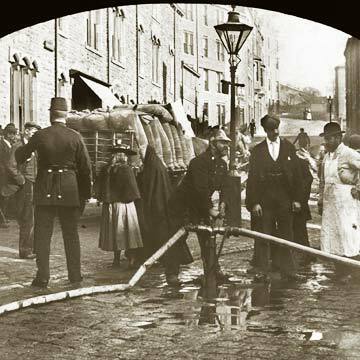 The dramatic incident that brought firemen and crowds to the bottom of Hangingroyd Road, Hebden Bridge, around 1910 is unknown but evidently it had been dealt with by the time the photographer arrived on the scene. The shop, left, was a butcher's (run, perhaps, by the gentleman on the right in the apron); the heavily-laden lorry was probably on its way to Everest Works just round the corner in Brunswick Street. A tremendous thirst for knowledge was the driving force behind Hebden Bridge Literary and Scientific Society, established on December 4 1905. There were already several mutual improvement societies in the area providing an invaluable outlet for the working man and woman. Yet a need was felt for an organisation of a different kind: one with the avowed purpose of encouraging the intensive study of natural history, literature, "physical science" and other topics that members themselves would initiate. 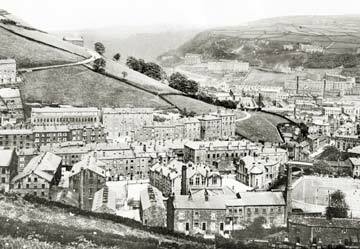 "To carry out the further education of the inhabitants of Hebden Bridge by means of assembling together to read and hear papers on subjects kindred to such an Association. By arranging rambles for the study of natural history. To stimulate interest in educational facilities." Membership of the General Society was 133 in the first year, reaching a peak of 1,640 in 1943 by which time there were many more sections. The rules provided that new sections could be formed by any three members with a particular interest falling within the society's constitution and soon the Natural History Section (which survived until 1959) had been joined by the Photographic (1905 - `60) and Literary Sections. Together with astronomy (originally formed in 1918 by a small group of enthusiasts led by "Greeny" Horsfall - Sir Bernard Ingham's maternal grandfather) Local History is the only section to survive to the present day. Marking the Golden Anniversary of the HBLSS in 1955- and still very active in the society's affairs - founder William Nowell attributed its success to a willingness to change with the times: "As I see it the most important factor is that, while maintaining its general appeal, the organisation has been elastic enough to provide a means of association for any sectional interest, whether it be astronomy or beekeeping. That has been the secret of its success." Little could those founder members, eager to learn and share their knowledge in a world on the brink of cataclysmic change, have foreseen what was in store for their descendants 100 years later. Much has changed beyond all recognition but the values and principles of the HBLSS remain as strong and relevant as ever. The story in full is told in issue 13 of "Milltown memories" and the special commemorative booklet, both available from local outlets and the publishers. went down in local annals as the worst in living memory. 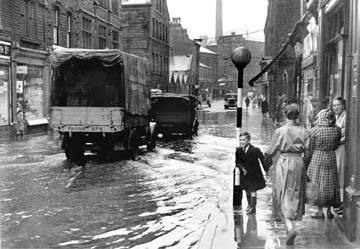 Here, Market Street, Hebden Bridge, is still under water - levels reached several feet in some parts of the town.